On Friday night food & beverage industry celebrities representing some of the hottest breweries and happening distilleries from across the country pour more than 100 different kinds of specialty craft beers and spirits samples in the Town Center and Grand Park. Along EATS Street, guests can nibble on a smorgasbord of savory small plate menu items prepared by a range of award-winning restaurants, eateries and food trucks. At Friday night’s Craft Beer & Spirit Jam, you will find small plates prepared by local favorites on EATS STREET, including: Roux 30A, Slick Lips Seafood & Oyster House, Cabana Café, The Craft Bar, The Bistro at The Courtyard Marriott Sandestin at Grand Boulevard, Cantina Laredo Modern Mexican, SaBai Thai Café, Grayton Beer Brewpub, LaCocina Mexican Grill & Bar, and Nanbu Noodle Bar. Featured breweries include Grayton Brewing Company, Props Craft Brewery, Gulf Coast Brewery, Perfect Plain Brewing Company, Destin Brewery, 3rd Planet Brewing, Burnt Hickory Brewing, Church St. Brewing, Tin Roof Brewing, Ye Olde Brothers Brewery, Shebeen Brewing and Quest Brewing. GURUFISH RETURNING TO 2019 CRAFT BEER & SPIRITS JAM! 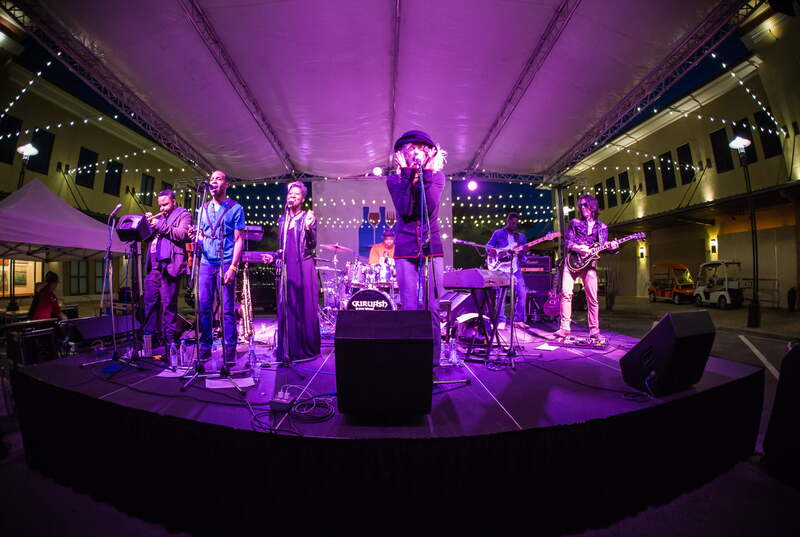 A funk/pop explosion with an extra tasty touch of glam, GURUFISH is back by popular demand for this year’s event. Unforgettable melodies fused with galvanizing grooves give birth to songs that will make your whole body smile… The thrill of the new and the excitement of the unexpected… all the things one hopes to find in music. Listed by PASTE Magazine as one of the 25 Georgia Bands You Should Listen to Now, as well as honored with the distinction of being recognized by the GA Music Awards as the Georgia’s Best R’nB/Funk Band.